The inventor of radar, sonar	and radio remote control built himself a fantasy castle in Gloucester MA. Inventor, electrical engineer, and collector, John Hays Hammond, Jr. (1888-1965), was instrumental in developing radio remote control and aspects of radar and sonar, including torpedo guidance systems, but he is remembered today for his quirky European castle-style home in Magnolia MA. Hammond grew up in a cosmopolitan and wealthy household. His father, John Hays Hammond (1855-1936), was a mining engineer who helped Cecil Rhodes exploit South Africa's hugely rich gold mines. The elder Hammond took part in the Boer War, was captured, ransomed, and returned to the United States, where he and his family lived in comfort. The junior Hammond did a lot of traveling himself, and grew rich on government defense contracts and the proceeds from his inventions. He became a director of RCA (Radio Corporation of America), and spent his wealth on his obsession: European history, which he approached with a macabre sense of humor. 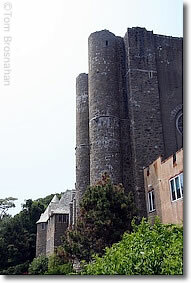 Hammond Castle, his eccentric European castle-style mansion in Magnolia MA on Cape Ann, was built in four sections, each made to epitomize a distinct period of European architecture: the Great Hall is Romanesque, the interior courtyard is fitted out as a medieval town square, and the living quarters are Gothic and Renaissance French. Despite his name and his interest in things electric, John Hays Hammond, Jr, was not related to Laurens Hammond, inventor of the electric organ. If your travels in New England take you to Cape Ann and Gloucester MA, be sure to visit Hammond Castle Museum. home of John Hays Hammond, Jr.